Keeping up with comics can be a hassle. There are so many of them and they come out every month. And even though Stan Lee once said that they merely show the “illusion of change,” the status quo of many comics these days changes and we get new comics starting and old comics ending (or new comics ending, as it were). So why don’t we look at where Marvel is right now with, say, all of it’s comics. Back in May 2018, Marvel did another relaunch called “A Fresh Start.” Yes, that makes this the fourth relaunch since 2015, but Marvel is hooked on it’s “seasonal” model of publishing, so let’s just go with it. 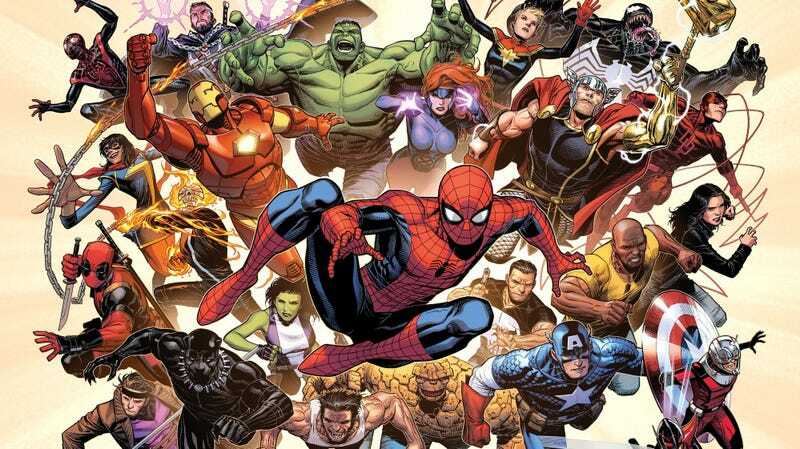 The first book to be relaunched was Avengers, with a new volume written by Jason Aaron and illustrated by Ed McGuinness. As you can see from the cover, the members of this Avengers team are: Captain America, Thor, Iron Man, Captain Marvel, Black Panther, She-Hulk, Doctor Strange, and Ghost Rider. The Robbie Reyes Ghost Rider, that is. In the first arc, they have to face off against the “Final Host” of Celestials. You’d think that with Jason Aaron writing, the book would be just as good as his run on Thor, but it’s just...okay. It’s not terrible, but it’s not particularly amazing either, and there are weird continuity glitches all over the place. Still, it had it’s 700th legacy issue recently and things seem to be moving along. The most intriguing of all the individual Avengers books is the new volume of Black Panther, written by returning writer Ta-Nehisi Coates and illustrated by Daniel Acuña. Add in the fact that T’Challa’s sister Shuri also got her own book, written by Nnedi Okorafor and illustrated by Leonardo Romero, which tells of how Shuri is handling things after T’Challa’s mysterious disappearance, and the Wakanda books are looking pretty damn amazing. The book presents Shuri as a combination of her comic book self (the “Ancient Future,” a mystical leader) with the movie version (a technological genius) to create a really nice, fun hybrid. Meanwhile, Doctor Strange himself has been getting into interstellar adventures in the new volume of Doctor Strange, written by Mark Waid and illustrated by Jesus Saiz. One day, Strange suddenly loses the ability to see magical creatures. And then he loses the ability to do magic at all. Magic hasn’t vanished, it’s just his capacity to do it that has. So, after consulting with Tony Stark, Strange takes one of Stark’s spaceships and goes off an a interstellar voyage to figure out how to get his mojo back. It might seem weird, considering that we’ve already seen two recent storylines where Strange “lost” his magic, but this one actually works really well, especially as it explores magic on other planets and gives Strange some new characters to interact with. Thor, on the other hand, is still mixed up with the same stuff in the new volume of Thor, written by long-term writer Jason Aaron and illustrated by Mike del Mundo. The book is also continuing the storylines of future King Thor as he battles against a Phoenix-powered Wolverine and a Young Thor, who still strives to be worthy of lifting Mjolnir. It’s still good, although we’ve seen it before. Next up is, oh boy, Tony Stark: Iron Man, written by Dan Slott, with art by Valerio Schiti. And if you were getting bored by Slott’s writing of Spider-Man, well, you won’t be with his writing of Iron Man, since it’s goddamn awesome. Dan Slott has stated that his pitch for this run was ““Okay, it’s Robert Downey Jr. starring sometimes in Black Mirror and sometimes in Rick and Morty.” And it really does feel that way sometimes, as Tony is running his new company, Stark Unlimited, and is preparing to release a realistic VR platform called the eScape, while he also fights conspiracies and romances Janet van Dyne. Oh, right, there are other characters in this book, too: some new, some old, including Rhodey, Bethany Cabe, and Jocasta, who has one of the most interesting subplots in the book. The new volume of Captain America, written by Ta-Nehisi Coates, with art by Leinil Francis Yu, feels a lot like a throwback to Ed Brubaker’s run on the book. This isn’t a bad thing — Brubaker made the book like a spy novel, but with a brightly colored superhero instead of, say, Harry Palmer. Coates keeps that feeling of secrets and conspiracies, with General Ross, now working for the government again, telling Steve that nobody trusts him anymore after his doppelganger took over the U.S. for Hydra. With Ross not giving him any missions, Steve has to find other allies, including T’Challa (hey, the book is written by Ta-Nehisi Coates), as he looks into a group called the “Power Elite,” who seem to be unleashing Nuke clones all over the place. If you want a spy-themed Captain America series, well, this one is for you. Carol Danvers, on the other hand, doesn’t actually have an ongoing book at the moment. The Life of Captain Marvel, written by Margaret Stohl, with art by Carlos Pacheco and Marguerite Sauvage, is only a five-issue mini-series. Still, Carol is going through an interesting time: learning that her mother is actually Kree, so she is half-Kree, and her powers came from within and not from Mar-Vell was certainly a shock. It’s a good thing, then, that in January 2019, Carol will be getting her own book back, with a new volume of Captain Marvel written by Kelly Thompson, with art by Carmen Carnero. Considering that I will buy anything Kelly Thompson writes (her Nancy Drew series is goddamn amazing), I consider this a good thing, even if it does smell like corporate synergy. That’s all the Avengers that have books (sorry, She-Hulk and Ghost Rider). But that’s not all the books Marvel is putting out, so let’s get cracking. Immortal Hulk, by Al Ewing and Joe Bennet, is seriously one of the best Marvel comics I have ever read. I am not exaggerating. As a horror fan, I love that Ewing is making this a horror comic through and through. The Hulk isn’t just Bruce Banner’s anger — he’s the Hyde to Banner’s Jekyll, smart and sinister. Bruce might be a scientist, but the Hulk relies on “magical thinking.” And if Bruce were to, say, die, well, he would be dead. Until night falls and then the Hulk would come out. PanelxPanel recently did a long interview with Ewing and Bennet and the YouTube channel Strip Panel Naked recently did an entire video on Bennet’s panel layouts, which should tell you how good they are. Seriously, I can’t stress this enough: this book is so goddamn good. Speaking of good, the new volume of Amazing Spider-Man, written by Nick Spencer, with art by Humberto Ramos, is surprisingly good. I know, I know: “But Nick Spencer is terrible!” I hear you cry. Yes, he botched Secret Empire. (I’d argue that it was a good premise, but the overall writing was lacking.) Yes, he turned Captain America into a Nazi. And yet, it seems like he was much more suited for Peter Parker than he was for Steve Rogers. In fact, almost immediately, he does something amazing: he gets Peter and Mary Jane back together. And he manages to imbue to the book with a sense of fun and familiarity that it had previously been lacking. I mean, sure, Peter is still broke, his thesis was reported as plagiarized (since Doc Ock actually wrote it), and he has to have two roommates (one of whom is the supervillain Boomerang), but still: it’s fun! Speaking of Spider-Man, let’s take a look at the current Spider-crossover, Spider-Geddon. Spider-Geddon is the sequel to 2014's Spider-Verse crossover (yes, yes, smell that corporate synergy). The main book is written by Christos Gage and Dan Slott, with art by Jorge Molina, while there are a number of attached mini-series. The basic premise is that due to Doc Ock’s meddling, the Inheritors (the villains from Spider-Verse) have managed to escape their radioactive prison and have returned to, well, kill all the Spider-people. This time, however, Doc Ock is leading a team as the Superior Spider-Man that will do “whatever it takes” (i.e. kill) to stop them, while Miles Morales is leading a team that, uh, won’t kill. Yeah, I know. On the plus side, there are new Spider-people, like a Norman Osborn Spider-Man (uh) and Spiders-Man, a group of sentient spiders that believes it to be Peter Parker (oh god). Spider-Force #1-3: A group of Spider-heroes form a kind of suicide squad to venture into the radioactive Earth that the Inheritors escaped from and stop them from resurrecting their father, Solus. Notable in that it is written by Christopher Priest, who is turning out some amazing characters, like Spider-Kid and Astro-Spider. Art by Paolo Siquiera. Spider-Girls #1-3: Renew Your Vows might be over, but Annie May and her family are still here, this time teaming up with May “Mayday” Parker and Anya Corazon to figure out the ancient scrolls of the Spider Totems in order to stop the Inheritors. Written by Jody Hauser, with art by Andres Genolet. Spider-Gwen: Ghost Spider: Not actually a mini-series, but a spin-off (like the previous Spider-Gwen book spun-off from Spider-Verse), here, Spider-Gwen is trapped on another Earth with no way to find her way home. Written by Seanan McGuire, with art by Rosi Kampe. Superior Spider-Man: Another spin-off, this time starring Doc Ock himself, as he tries to be a hero again, this time in San Francisco. Written by Christos Gage (hmm, I wonder who he favorite character is? ), with art by Mike Hawthorne. And now, let’s move on the other crossover happening in Marvel right now (yes, Marvel has replaced one big crossover with two smaller crossovers — baby steps): Infinity Wars. Infinity Wars (yes, I know, smell that corporate synergy again, oh god it smells like feet) is the main crossover for all of the “space” characters: the Guardians of the Galaxy, Captain Marvel, Adam Warlock, and, uh, Black Widow and Doctor Strange, too. Infinity Wars: Sleepwalker #1-4: Written by Chad Bowers and Chris Sims, with art by Todd Nuack, the obscure hero Sleepwalker sets about stopping Gamora’s plan by recruiting several of the warped characters, like Little Monster (Ant-Man + the Hulk) who gets stronger and smaller the more angrier he gets. Yes, really. Infinity Wars: Soldier Supreme #1-2: Written by Gerry Duggan, with art by Adam Kubert, this book is about “Stephen Rogers,” who gain mystical powers in the ‘40s to fight Nazis. Yes, his best friend is named Bucky Wong. Infinity Wars: Iron Hammer #1-2: Written by Al Ewing, with art by Roman Rosanas, this book is about “Sigurd Stark,” a tech billionaire who gets captured by Dark Elves and forced to make a suit of armor from Cold Iron, along with a technomagic hammer. Look, I told you it sounded goofy, but it’s also awesome. Infinity Wars: Arachknight #1-2: Written by Dennis Hopeless, with art by Alejandro Garza, this book is about Peter Parker, whose aunt and uncle were killed by a creature called “Goblin-by-Night” and he himself was mortally wounded, until a spider gave him mystical powers by biting him, along with multiple personalities. Infinity Wars: Weapon Hex #1-2: Written by Ben Acker and Ben Blacker, with art by Gerardo Sandoval, this book is about Laura Kinney, who was born in order to become a weapon and vessel for “Mephicton,” a demon. I’m telling you, these are all better than they sound. Infinity Wars: Ghost Panther #1-2: Written by Jed McKay, with art by Jefte Paolo, this book is about Prince T’Challa, who was exiled and started working as a daredevil in the circus, taking the name “Johnny Blaze,” when the death of his father forces him to make a deal with the Devil and become...the Ghost Panther. Infinity Wars: Infinity Warps #1-2: An anthology of random stories about various warps, like Moon Squirrel and Tippysaur, Green Widow, Kamala Kang, and the Punisher Pack (yes, you read that right: it’s the Punisher crossed with Power Pack). And then there’s the Asgardians of the Galaxy, written by Cullen Bunn, with art by Matteo Lolli, where Angela teams up with Valkyrie, Thunderstrike, Skurge, Throg, and Kid Loki in order to stop Nebula from bringing up the end of everything in an attempt to one up Gamora. Look: there’s Throg and he’s killing dead zombie gods, what’s not to love? The new volume of Venom, written by Donny Cates, with art by Ryan Stegman, explores not just the relationship between the symbiote and Eddie Brock, but also the relationship between the symbiote and, well, it’s god. Yes, it turns out that there is a God of Symbiotes, who actually Knull, the creator of the Necrosword from Jason Aaron’s Thor: God of Thunder. Unsurprisingly, this isn’t the only Venom book (sniff, sniff, do I smell corporate synergy? ): there was also Venom: First Host, written by Mike Costa, with art by Mark Bagley, which was a mini-series exploring the first host for the Venom symbiote, a Kree soldier called Tel-Kar. And then there was Web of Venom, a series of one-shots introducing new plots: Web of Venom: Ve’Nam introduced the fact that there was an elite group of soldiers during the Vietnam War that wore symbiotes, and Web of Venom: Carnage Born, which brought back Carnage from the dead (again), but this time with an upgrade and a deadlier mission. Finally, a new volume of Fantastic Four! Written by Dan Slott, with art by Sara Pichelli, this is the first new Fantastic Four book in three years. And goddamn, it feels good to have them back. And yes, they are back: the First Family of Marvel have finally stopped their exploring of the newly made multiverse now that Franklin’s power to create new universes has diminished and they faced off against the Griever at the End of All Things (yes, that is her name). But the most exciting thing is that Ben Grimm is finally getting married to Alicia Masters — and, I swear, Marvel better not screw this one up, because we are 0 for 2 in “comic book marriages” this year. Although I am sad to see the end of Marvel Two-in-One, written by Chip Zdarsky, with art by Ramon Perez, which was about the adventures of the Thing and the Human Torch. I wish it could go on (Zdarsky writes an amazing Ben Grimm), but it sadly came to an end with issue #12. A new volume of West Coast Avengers, written by Kelly Thompson, with art by Stefano Caselli, is also amazingly fun. Serving as a fun team book and as a continuation of Thompson’s Hawkeye book, the West Coast Avengers are: Kate Bishop, Clint Barton, America Chavez, Fuse (Kate’s boyfriend), Quentin Quire, and Gwenpool. Yes, that’s right: Gwenpool. Who still maintains her fourth-wall awareness and is just generally awesome. What kind of threats does the team face? Would you believe street sharks? What about B.R.O.D.O.C.K., the Bio-Robotic Organism Designed Overwhelmingly for Kissing? What about a giant Tigra? No, not a giant tiger, a giant Tigra? Also, they showed up on Jimmy Kimmel Live! And, finally, we get to Ironheart, written by Eve L. Ewing, with art by Kevin Libranda. What can I say about this book that will convince people to buy it? Well, it’s really, really good. Like, surprisingly good. It’s apparent that a lot of not just thought, but heart and soul was put into this book and it shows. Riri Williams is a tech genius, but is no good at social situations and has very little friends. All she really wants to do is, well, fly. But she also fights for what she believes is right and the first issue takes a good look at why she does this, as well as deepening both her character and the world around her. Also, she cosplays as Geordie la Forge. What is not to love about this book? Well, I think that’s enough for today. I know I missed a bunch of books, but I take a crack at them later. Especially the X-Men, who are going through another relaunch, and the Defenders, which are going through an experimental phase. Yes, both teams of Defenders.